The welcoming, knowledgeable Highlands Family Chiropractic Center Centennial team looks forward to helping improve your quality of life. We provide services for all ages and excel at tailoring health care to your goals, whether you seek to relieve pain, correct a problem or optimize your overall wellness. Combining structure and function, chiropractic care focuses on your spine to restore the health of your nervous system. This vital system controls the functions of the body, and losing spinal motion or alignment can mean compromising the nervous system. Dr. Hicks focuses on corrective chiropractic care and uses a variety of techniques that will be selected to suit your condition and comfort level, such as Activator Methods®, Chiropractic BioPhysics®, Diversified, Gonstead, Cox Flexion-Distraction, Logan, Motion Palpation, Myofascial Release, Toggle and Neuromuscular Re-education. Intersegmental Traction. Joint motion, disc hydration, blood and oxygen circulation, muscle relaxation and the reduction of swelling are all promoted with this technique. You’re gently stretched and elongated to retrain spinal muscles, allowing you to improve your mobility and reduce the effects of scar tissue. Electric Muscle Stimulation. A wide variety of benefits can be seen with this therapy, such as pain relief, cellular metabolism, swelling reduction and soft tissue healing. Traction. 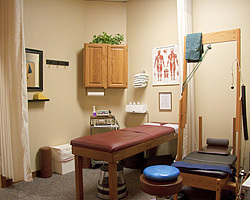 Retrain and remodel your spine, making corrections for long-term health. With proper motion and curves, you can reduce the wear and tear on your spine that causes breakdowns over time. If you’ve been in an accident, don’t delay getting help. Seek care before your injuries could become permanent. We offer comprehensive care plans, and we’ll work hard to get you better. Dr. Hicks is nationally certified and registered to provide DOT physical exams for Commercial Driver’s License (CDL) drivers. With comprehensive knowledge of the regulations and rules involved, we’ll get you in and out of the office quickly. For more information about necessary documents or clearance prior to your appointment, click here. From that site we recommend you download the guidebook to take the stress out of your DOT medical exam. We do accept walk-ins but highly recommend an appointment in advance. Offered on-site for your convenience, our modern X-ray facilities allow us to see the full picture of your health and understand how best to help you. Optimize your life, naturally. Contact our helpful, friendly team today to find out what we may be able to do for you!